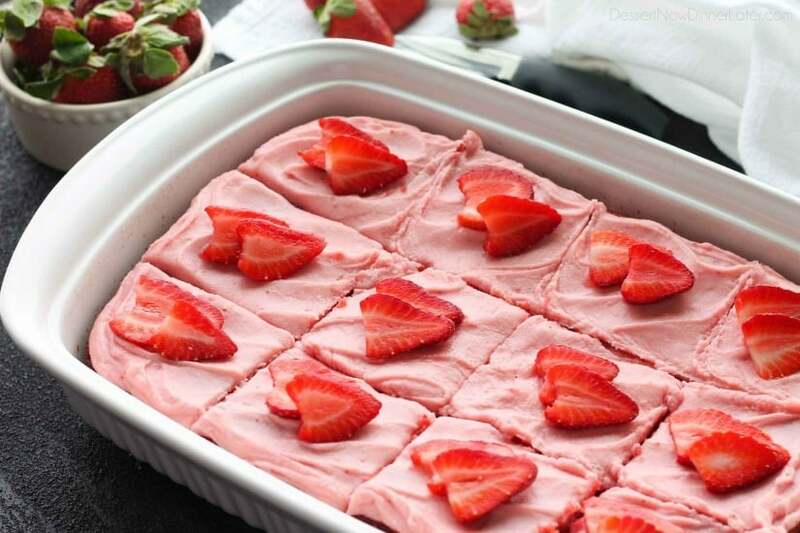 Favorite Strawberry Cake - Dessert Now, Dinner Later! 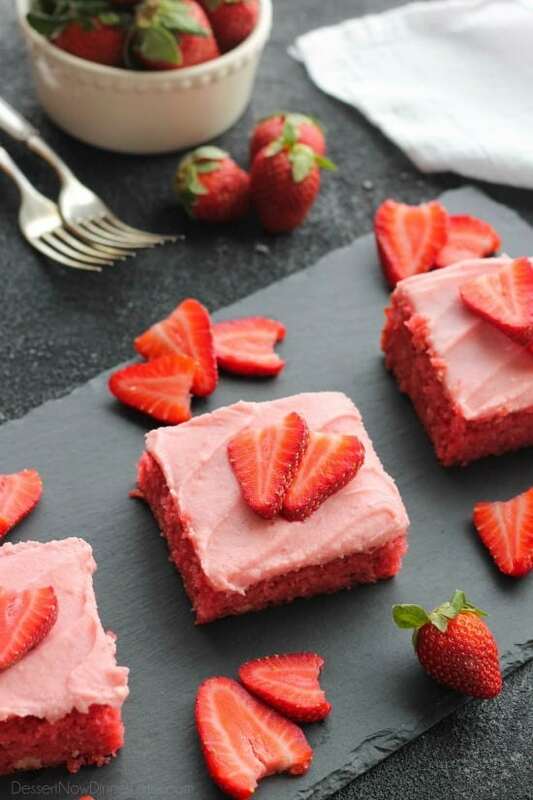 This strawberry cake uses fresh strawberries and flavored gelatin for a super flavorful strawberry sheet cake that will feed a crowd. It’s really easy, and incredibly moist too! 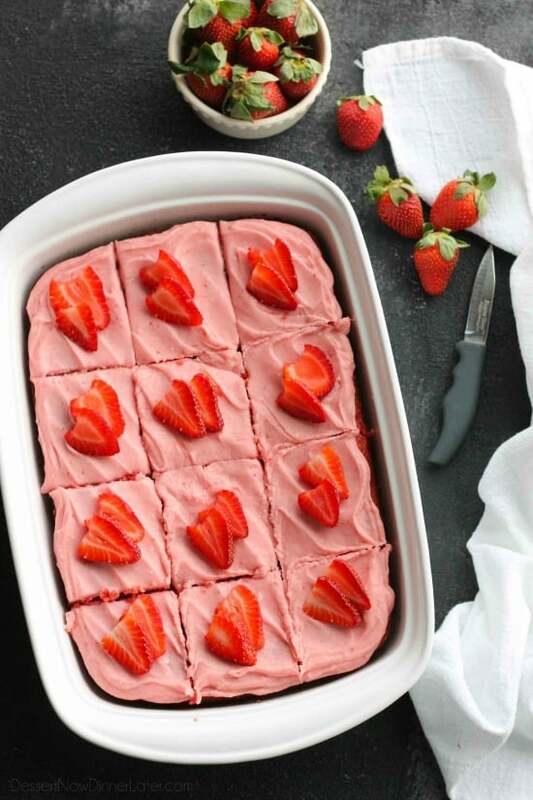 Growing up, my siblings and I called this, “Valentine’s Day Cake” because my mom would always make this strawberry cake in heart shaped pans for Valentine’s Day. It was something we looked forward to every year as kids, and I just can’t help but make it for my own children now that I’m grown. 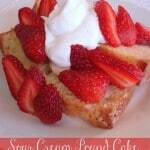 It’s our favorite strawberry cake recipe! I have slightly adapted the recipe because the original recipe’s frosting was SUPER runny. It is a bit tricky to make a fresh strawberry buttercream that is stiff enough that it doesn’t run off the cake, but I’ve found a great solution: natural strawberry preserves! 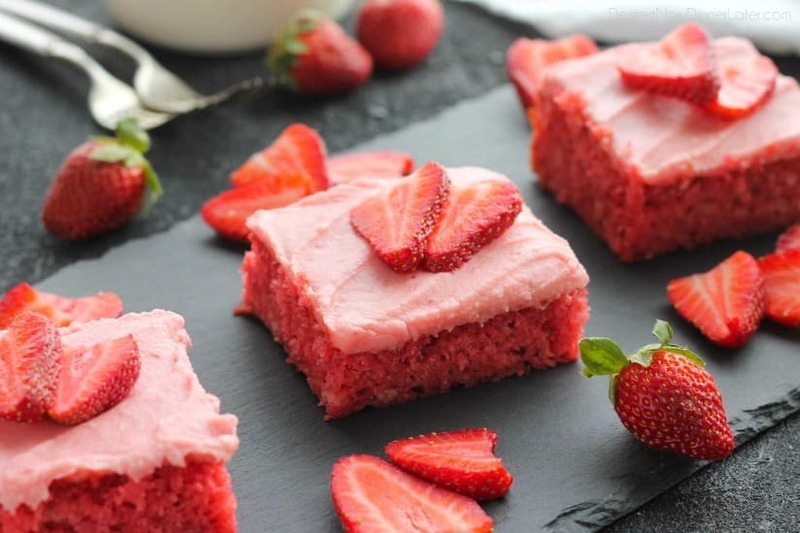 It gives the frosting that strawberry flavor, but since it is gelatinized from the pectin, it helps keep the frosting from running off the cake. It’s the same concept as making a stabilized whipped cream with unflavored gelatin. I even saved some of the strawberry gelatin for the cake to use in the frosting as well. The original cake portion of the recipe used frozen strawberries in syrup, and I felt like that was unnecessary. 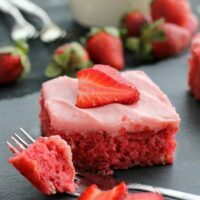 As much as I loved sugar as a kid (and still do), using fresh strawberries is a great solution, and the cake is still plenty sweet. This is one of those recipes that a lot of people have and love. Similar recipes are all over the internet, but this is my variation and I hope you’ll try it! It might even become a yearly tradition for your family each Valentine’s Day. Preheat oven to 350 degrees Fahrenheit. Spray a 9x13-inch baking dish with nonstick cooking spray. Rinse strawberries and dry with a paper towel. Remove stems. 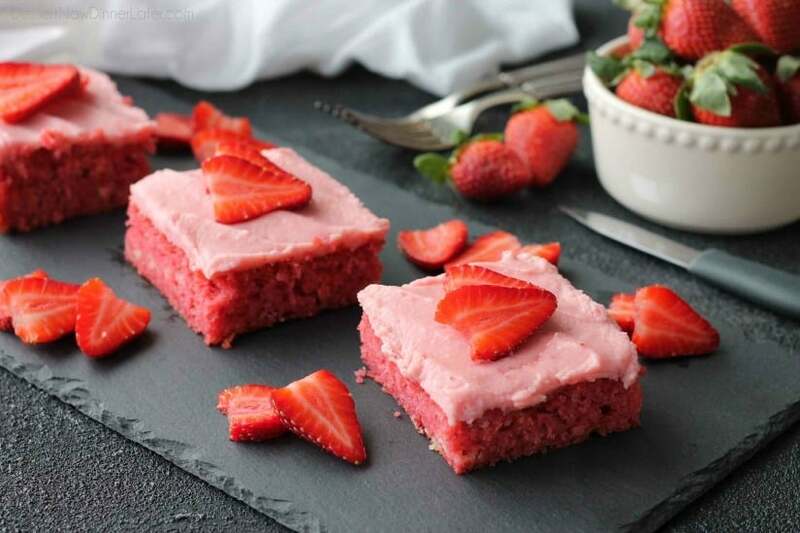 Place strawberries in a blender or food processor. Pulse until crushed or blended smooth (desired consistency). Reserve 1 cup. Set aside. 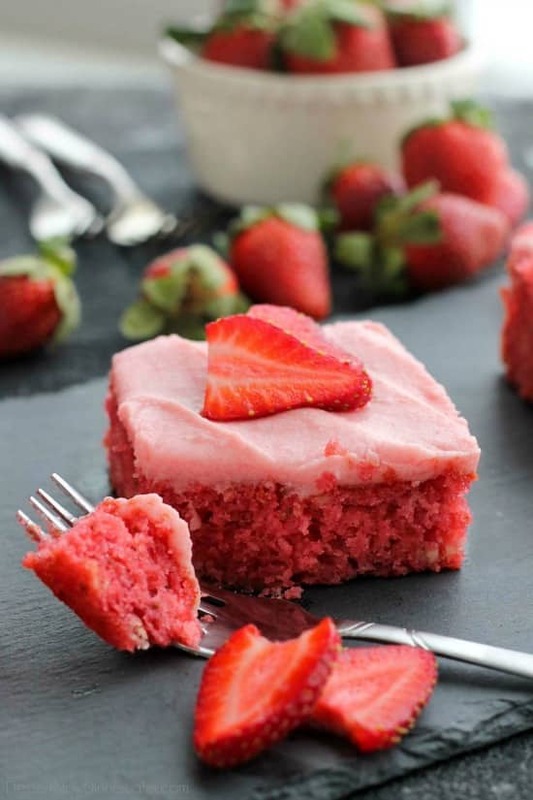 In a large bowl, whisk the cake mix with strawberry gelatin powder (reserving 1 tsp of the strawberry gelatin powder for the frosting, if desired). Add the eggs, oil, water, and 1 cup of crushed/pureed strawberries. Mix well. Pour batter into the prepared baking dish. Bake at 350 degrees Fahrenheit for 30 to 33 minutes or until toothpick comes out clean when placed in the center of the cake. Allow cake to cool completely. MAKE THE FROSTING: In a large bowl with an electric hand mixer, beat the butter until smooth and creamy. Add the strawberry preserves and 1 cup of powdered sugar. Blend well. Add 1 more cup of powdered sugar and the reserved teaspoon of strawberry gelatin (optional). Blend well. Spread over cooled cake. 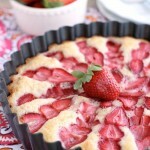 Serve with additional sliced fresh strawberries if desired. TIP: Add 1 tsp of milk to the frosting, if needed, for a more spreadable consistency. - HIGH ALTITUDES add 3 Tbsp all-purpose flour to the cake mix. 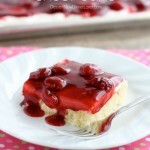 - You may use FROZEN strawberries for this cake if you let them thaw, and then drain as much of the juice as possible. Hello, question I’m going to make this today and the strawberry preserve is that strawberry jelly? Also the tsp of strawberry jello that you set aside for the frosting at what point do I add that? Hi Jackie! Strawberry preserves and strawberry jelly are about the same. Preserves have chunks of fruit, jelly doesn’t. Either will work just fine. Thanks for catching the mistake with the frosting. I’ve updated the recipe. Add it with the second cup of powdered sugar. Good luck, and enjoy! Amber, thank you soooo very much! I made your banana cake yesterday with the To die for Cream Cheese Frosting! All I can say is WOW! Both were beyond words delicious!! Thank you so very much for sharing your AMAZING recipes. Aw! That’s so great! Thanks for letting me know! Hopefully you love this just as much! Quick question- Can I cut the powder sugar in the frosting to 1 cup instead of 2? I like a less Sweet Frosting will I have to cut the butter back as well? Hi Jackie! I’m so glad you love the cake! You are definitely welcome to cut the sugar in half, it just won’t make quite as much frosting. Yes, but it will also effect the texture/consistency some. It might be thick and not as smooth and pipe-able. Can this be made into a layer cake as well? 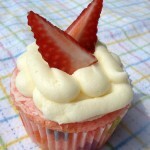 My son wants a strawberry layered birthday cake this looks so yummy!!!! I am planning on making a double batch and using heart shaped cookie cutters to make individual heart shaped layer cakes for my Valentine’s (my kids lol). I cannot wait to try it. I bet the Jell-O makes it crazy flavorful!! Thank you for sharing this recipe with us. Happy Valentine’s Day! That will be so cute! I hope it goes well for you! Should the oil be 1/4 cup and water 1 cup? Nope. If you want to swap a little bit of the oil for water, you can drop the oil down to 2/3 cup and do 1/4 cup plus 1/3 cup water. The oil helps keep the cake moist. Amber, I made this folling the directions to a T. It is amazing!!!! !Keep up the good job!!! Can this recipe be used for cupcakes as well? I’m not positive. The batter doesn’t rise a lot. You may want to increase the temperature to 400 degrees and bake them for less time, about 11-13 minutes, to try and get them to grow upwards quicker. Let me know if you try it out and if it works or not.